On Jan. 1, California’s minimum wage was raised by 50 cents to up to $11 as part of a 2016 bill signed by Gov. Jerry Brown to eventually raise the state minimum wage to $15 in 2023. This change is a welcome bonus to many working Carmel High students, but it also marks hard times for businesses throughout the Monterey Peninsula and California. 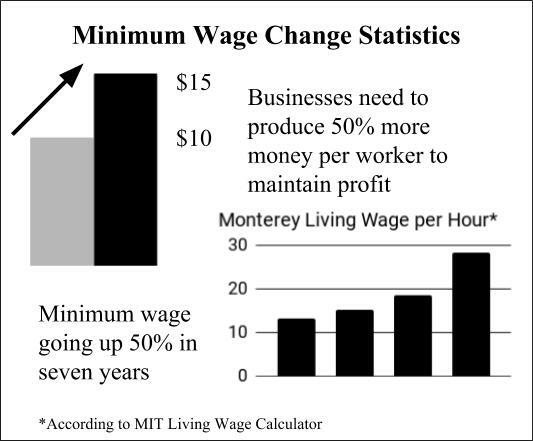 According to the Living Wage Calculator from Massachusetts Institute of Technology, the most recent change only brings one demographic bracket for Monterey County up into the living wage category; however, as the minimum wage continues to climb in the years to come, more of those standards will be met. Although this change arguably helps workers, it places an increasing amount of pressure on business owners who now must raise prices or otherwise compensate for the new demands. With this pressure on businesses in mind, the bill mandated that for businesses with 25 or fewer employees the minimum wage be $10.50 rather than $11 for businesses with more than 25 employees, and the minimum wage will scale upward by $1 until both hit $15. Solutions available to business owners include raising prices, firing workers and automating low-skill jobs such as operating cash registers or working on an assembly line. Jeff Clemens, an economist at the University of California, San Diego, conducted research studies in 2014 and 2015. He concluded that minimum wage hikes between 2006 and 2010 have contributed to 40 percent of low-skill job losses that have not recovered. When wages and prices rise simultaneously inflation occurs, or the dollar loses value because it has less purchasing power than before. Opponents of minimum wage increases argue that if enough inflation occurs then the minimum wage bumps will mean nothing because the workers have not actually gained any net purchasing power. However, many economists agree that research is still ongoing and that minimum wage hikes do not necessarily result in inflation. As a safety measure, Gov. Brown added a provision to the bill that, should the wage hikes cause economic downturn, the raises can be slowed or stopped, marking a ray of hope for business owners that have a lot to lose, while still attempting to help the poorest in society.